All transactions are safe and secure with a reliable history in online purchasing behind each of our associates. 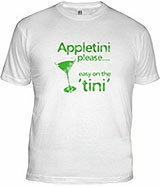 Buy the Appletini please... easy on the 'tini' t-shirt to own Scrubs clothing and merchandise. The appletini is Zach Braff's Scrubs character's favorite drink. He considers it a straight-guy drink, despite its obvious feminine drink characteristics. In a memorable Scrubs episode guest starring Keri Russell as Melody O'Harra, J.D. is forced to pay for his Appletini with a one hundred dollar bill. He hesitates at first, claiming that the drink was light on the 'tini'. This Scrubs tee shirt features a distressed green design that displays an image of an appletini. In addition to the Appletini please... easy on the 'tini' tee above, browse the Scrubs Clothing Gallery for more apparel like men's and women's clothes, kids shirts or hoodies.